Approved Performance are an aftermarket, OEM replacement parts seller based out of Bloomingdale Illinois, run by Keith Boyer. Approved Performance sell superior vehicle parts for breaking systems, hubs and shafts. The products are fantastic, priced at a level where they are competitive with OEM parts but far superior in quality they provide genuine value for customers. The biggest problem for the customer is finding the part that fits their vehicle, sometimes opting for inferior products, at higher prices to guarantee fitment. The other option is taking the risk on a product, only to find it doesn’t fit, return the product and start the search all over again. Keith started selling parts through Amazon in 2014 after being invited to sell on the platform. In order to sell motor parts on Amazon, sellers need to provide a catalog of fitment data to let customers choose fitment. Initially Approved Performance had a catalog of parts and fitment which enabled them to have vehicle fitment in their Amazon products. However, there were inaccuracies in the data and some of the information was not specific enough as parts differ between drivetrains, fuel types and engines. These inaccuracies led to high return rates and dissatisfied customers. Frustrated with high return rates and spiraling return freight charges, Keith got in contact with the team at PartsConnect. PartsConnect repaired the fitment data, bringing in additional options to increase the specificity of a vehicle. Once the data was re-worked Keith was able to update his entire Amazon inventory with 1 click. He immediately saw huge changes in returns and freight costs. As well as selling via Amazon, Keith also sells on eBay. EBay’s system already allows for pretty detailed parts fitment using K-types so there was less of a problem. Keith wanted to become more professional on eBay so took on the services of Frooition to provide a more professional design for eBay. Now that Approved Performance was Multi-channel, Keith wanted to build an e-commerce website but was eager to not repeat the issues he had faced on Amazon. Keith went to the PartsConnect team to ask if they could help. PartsConnect were delighted to help Keith with his website data, however they are focused on fitment data and building software to help parts sellers, not providers of design and branding. PartsConnect reached out to the Bigcommerce partnership team to see if there were any partners that could help build Keith a brand. By happy coincidence Frooition were introduced as the e-commerce design experts. Over the course of 6 weeks, Frooition, PartsConnect and Approved Performance worked together to build a beautiful looking website that drives customers directly through to the right parts for their vehicle in the least number of clicks. Every click between a customer entering a site and finding a product reduces conversions. Together we strived to reduce that user journey to the bare minimum. Approved Performance built a custom search widget for the store that asks for up to 8 pieces of information about the buyer’s vehicle. Almost immediately the parts are brought straight to the customer, filtering the results from several thousand to a handful of perfect fitting parts. Frooition then built a custom e-commerce brand for Keith and worked seamlessly with PartsConnect to ensure the search functionality was truly incorporated into the design. As well as styling the site and building the brand, Frooition helped build a custom flow through the store as the standard category, brand and search functionality was no longer required. The results of this collaboration are a unique buying experience for buyers, they can feel assured that the parts they are buying are correct. There is very little room for error as buyers only see the products that fit their vehicle. The technology and design flow together provide a great experience, minimal confusion and have built a fantastic store ready to slash returns and vastly improve conversion rates. If you would like to discuss working with Frooition and PartsConnect get in touch with us today and we will arrange a joint conversation. Like many successful eBay businesses, Sarah Kadlic started out on eBay by selling some of her own things from around her house. When she had no unwanted items left to sell, she decided to try selling one of her paintings. Having always painted as a hobby, Sarah decided to try listing one of her paintings. She had never sold her art before and was unsure how people would respond to them. After a couple of weeks with no responses, Sarah began to lose confidence and went to take the listing down. It was when she went to take the listing down that she saw someone had commented saying how much they liked the painting and asking if it could be made a little larger. Sarah was overjoyed. This was all the confirmation she needed to know that there was a market for her paintings. Sarah sold her first painting on eBay for $10 profit. Ebay had helped Sarah to monetize her hobby. She was happy, but what she didn’t realise was that this was actually just the beginning of her art career. By 2006 Sarah was routinely painting two paintings a day and listing them to her eBay store to be auctioned off. Sarah’s confidence had grown with her customer base and her paintings were now starting at $49 and sell upwards of $200-$700 sometimes. Sarah was growing a strong customer base, expanding her range of paintings and expanding her stock to include one of her other passions; vintage fine jewelry. As eBay grew and because more artists came to sell on eBay. I’d been reluctant up to this point to spend money on my web image. However, the work I had seen the Frooition team do on websites made me realize this would be so worthwhile and would elevate my items and brand! Selling high ticket luxury items, it was important that Sarah Kadlic’s content and visuals of their website convey luxury, in order to reflect the products and encourage trust from customers. I was struggling with how to combine my art and jewelry. I kept thinking they should be separated since they are so different, and I wondered how receptive people would be to seeing both together if they were only interested in one or the other. My Frooition designer Kim thought it would be great to combine both and create a brand name (mine) around them. I was worried about seeing my name in limelight but I trusted my designer who not only had a great knack for style, but she knows a lot about marketing online. I was really interested in having beautiful pictures and design simplicity and the Frooition designers knew exactly how to arrange this so that customers could shop easily. People have always commented that my art was fresh and modern, but I never seemed to be able to communicate this through a shopping platform until now. There is such strong creativity driving this business. Beautiful artwork and a stunning inventory of precious jewelry from a range of eras. Sarah’s designer Kim was tasked with bringing all of these creative influences together to create one cohesive brand image. After looking at the wonderful pieces of jewelry and the art that Sarah creates for her collections and reading a little about her business I knew that it was Sarah who needed to be the main brand of the business itself. We then discussed adding each collection under the brand name Sarah Kadlic. It was important to both Sarah and myself to allow the products to be the main focal point of the store. I didn’t want to create a design that would take anything away from her products. I wanted the design to compliment them. I created a minimal design using a selection of colors that Sarah favored and taking inspiration from the pieces that Sarah Sells. I wanted to create a store design that involved the beauty of her paintings and the elegance of her jewelry collection. I used Sarah’s product images to create all the graphics that are in the design, which highlights the beauty of her inventory. 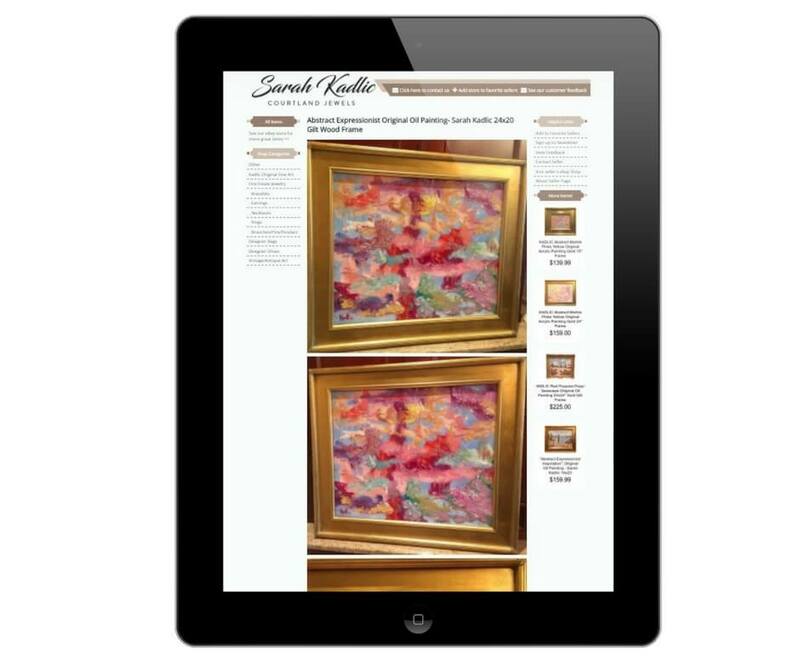 Whether the customer would be searching for a potential engagement ring on their smartphone during a lunch break or laying on the sofa in the evening browsing artwork from their tablet, we designed Sarah’s eBay listings and website to be optimized for every device. Our responsive design determines the dimensions of the display accessing the website and intelligently delivers the best user experience for each user, regardless of what device they're using. I now have a Shopify store and eBay listings which look professional and tell my brand story. Updating my stock is easy because all of my eBay items automatically pull into my Shopify website store. Beulah's Candyland is a confectionary store based out of Pennsylvania, United States. They are a small, family owned business with a dedicated team of long term employees. In addition to the online stores they also have 3 retail locations. The team behind Beulah's Candyland wanted to recreate the olde worlde feel of a traditional sweet store with a clean and modern feel. They wanted to display the breadth of stock without creating a cluttered feel. What made you trust Frooition? We had seen the quality of the work Frooition had done in the past. We have worked with Frooition for both our eBay and Shopify designs. Our designer was very accomodating and came up with some great ideas. What did you think of the final design that was installed? We really like the "Old Fashion Candy Store" concept throughout the design. It is simple, yet attractive. We loved the curtains and the awning effect. Universal Gadgets started from a spare room in a London flat and in 7 years has gone to a 1,200 Sq Ft warehouse fulfilling over 2,500 items every day. They feature in the tabloids for being the top seller on eBay's rich list, raking in £17m a year just from eBay Sales. We have chosen to use Frooition yet again to redesign our store for two reasons the first being eBay's new active content policy and Frooition's vast knowledge of the platform and rules and also we felt that a redesign was in order to keep our shop up to date and exciting. We have worked previously with Frooition and from start to finish, the whole experience was fast, friendly and exactly what we were after. What did you most enjoy about working with Frooition? Their online platform can be used to keep track of progress of the design and build at every stage, on here you can ask questions and be kept updated at all times. The final design was very bold and eye catching, which is what is needed on an online selling platform, it is easy to look like everyone else selling on eBay, what is hard is creating your own style with the limited layout functionality available and Frooition pulled this off no problem.